According to Google, social justice is the view that everyone deserves equal economic, political and social rights and opportunities. As many of you may already know, March is Social Justice Month. It is usually just a week but this year the Saint Rose community decided to dedicate a whole month to social justice! I don’t know about you, but (I’m feeling 22) that sounds pretty awesome to me! On Thursday, March 19, 2015, the sanctuary played a movie to go along with Social Justice Month called World Peace: And Other Fourth Grade Achievements. My EDU 300 teacher Aja LaDuke decided it would be a good idea during our class time to make the switch from Lally to the Hubbard Interfaith Sanctuary and watch the film, and I must admit she was not wrong. 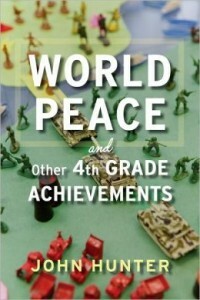 As I previously stated, the film was called World Peace: And Other Fourth Grade Achievements. This film told the story of a fourth grade teacher by the name of John Hunter who had a vision. His vision was to create a game that students could solve real world problems in a non-violent manner, so he created the “World Peace” game. The objective of the game is to obtain a world where all the problems are efficiently solved by having these countries, which were run by students, communicate and figure out how they could fix every obstacle they faced. The students needed to solve every conflict while maintaining world peace. The game called for a high level of communication among the students. Mr. Hunter served as an overseer or facilitator who did seem to not manipulate the game as it was going on. Before starting the game, Mr. Hunter had to assign a few positions to get the game started. He needed to decide which students of his would be best as prime ministers while also being able to push them just out of their comfort zone. This proved to be important because if the student was not interested, the game would not have gone as well as it did. After picking the prime ministers, Mr. Hunter let the students choose their “council.” He advised them that they could pick their best friend but their best friend might not be the best at that position. When the game began, several crises were introduced that the student had to be ready to tackle. As the game went as with each passing week, you could truly see how much the students were enjoying this activity, even though the game did get pretty heated among the students. The students viewed this game as a challenge as opposed to just another task or assignment that needed to be completed that day. As a future educator of the world, I thought it was awesome that the students were learning and enjoying their education because we’ve all had days where we’ve dreaded going to class. This really touched my heart. The students at one point actually convinced Mr. Hunter to throw in another real world crisis, which he didn’t normally do. The crisis introduced is known as global warming. The students felt as if they could handle it as well as needing to deal with an everyday real world problem. Eventually the game ended with the students achieving world peace! The students found the “saboteur” and solved all the problems. It was awesome to see the children as a team while also divided into countries to solve the problems. It seemed as time passed, the student’s passion increased and they were able to solve and beat Mr. Hunter’s game. This sounds like a really awesome game, we should see if we can get a version of it to play here at Saint Rose!